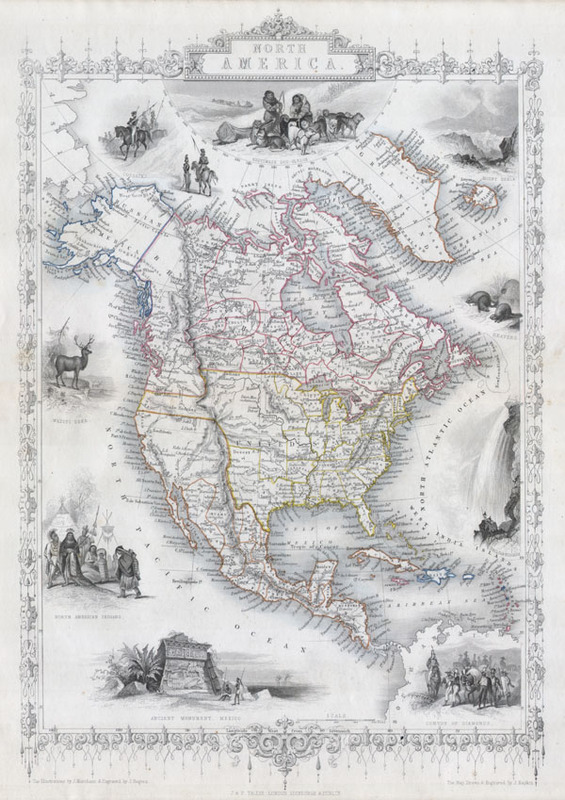 This is John Tallis's highly desirable and very rare 1850 Map of the North America. Made shortly following the entry of Texas into the Union, this map depicts an important point in American history. Herein Texas is shown at near its fullest extent including Santa Fe and but excluding the Green Mountain extension in the Northwest. Upper California has yet to become a part of the United States and while Oregon is included, Washington remains a part of British America. The mythical Buenaventure River appears in northern California. Offers several beautiful vignettes depicting 'North American Indians,' a 'White Dear,' Beavers, the 'Falls of Niagara,' a 'Convoy of Diamonds,' an 'Ancient Monument, Mexico,' 'Cossacks,' and the Esquimaux Dog-Sledge. Highly decorative border. Undated, but the form of Texas allows us to positively date this to the early 1850 issue of Tallis's valuable map.